Tightening your flabby arms can be accomplished with 5-pound weights. Light resistance training can give you a noticeable improvement in just a few weeks. It is also important to eat a healthy diet and incorporate cardio exercise into your daily routine to reduce fat around your arms, which contributes to a flabby appearance. When using 5 pound weights, do as many repetitions of your dumbbell exercises as you can and still use proper form. When you can no longer keep proper form, you have reached muscle fatigue. This is the point where you start building muscle strength and tone. The curl and hammer curl are effective toning exercises for your biceps brachii, located on the front of your upper arm. The dumbbell curl is performed by standing with your dumbbells on each side of your hips with thumbs pointed outward. Slowly bend your elbows as you curl your dumbbells up to your shoulders. Slowly lower the dumbbell back to starting position. Repeat until your muscles are tired. The dumbbell hammer curl is performed by holding your dumbbells by your thighs with your thumbs pointing up. Exhale as you slowly bend both elbows until the dumbbells are in front of your shoulders -- and inhale as you lower your dumbbells back down to your thighs. Repeat until your muscles are tired. Your triceps muscle is located at the back of your upper arm. This can be the most troubling spot for women, in particular. Triceps kickbacks are one of the three best exercises for toning your arms, according to the American Council on Exercise. Hold a dumbbell in your right hand. Assume a split stance, with your left foot forward. Tighten your core muscles and place your left hand on your left thigh and lean forward, allowing most of your weight to rest on your left thigh. With your right arm close to your torso bend your elbow to 90 degrees, placing your weight at your hip. As you exhale, slowly straighten your arm until it is fully extended -- which contracts your triceps. Inhale and return to your starting position. Repeat until your muscle is tired and switch to the other hand. The chest press strengthens your arms and shoulders. This is performed by lying on your back on the floor, elbows out and dumbbells at chest level, aligned with your armpits. As you exhale, press your dumbbells upward directly above your chest, keeping your hands shoulder-width apart. Inhale as you lower the dumbbells back down to your starting position. Repeat until your muscles are tired. Exercise your arms at least three non-consecutive days per week to see noticeable improvements in just a few weeks. Continue your arm toning exercises and increase your weight amount over time. Cardio workouts burn overall body fat, which will help speed up the process of tightening your flabby arms. 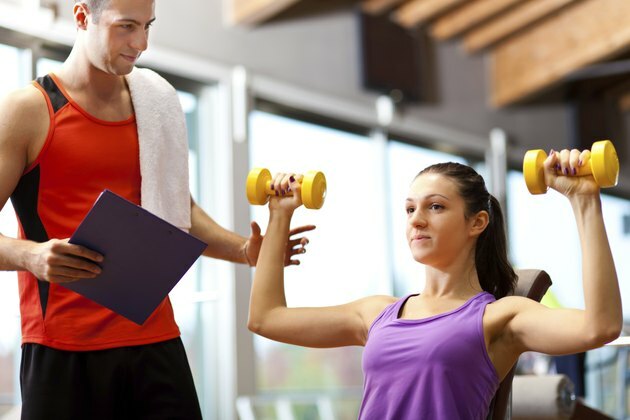 Consult with your doctor before beginning any exercise routine and stop exercising if you feel significant pain.